The Sabanas de Manacas Model Forest (BMSM, after its original name in Spanish), emerged from the need to better coordinate the efforts of institutions, communities and different local entities in the management of natural resources, as a way to face the growing problems of soil degradation, the increase of forest fires, the reduction of forest cover, the infestation of invasive species such as Marabú (Dichrostachys Cinera L.) and the need to protect water resources. The BMSM has become one of the broadest and most integrated initiatives for the sustainable management of natural resources in the country. It is an ideal platform to comply with many of the goals set forth in the National Forestry Program at the local level, facilitating the active participation of social sectors in the area, by means of coordinated action and cooperation. It is a channel that links communities and producers with national organizations and institutions, facilitating the transfer of knowledge, technologies and financial resources, among others. 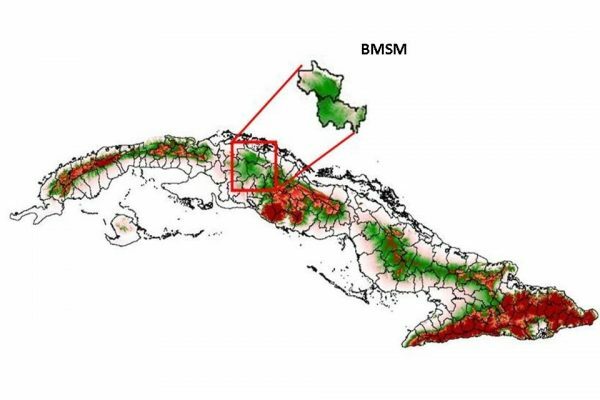 The creation of the BMSM and its integration into the International Model Forest Network (RIBM) and the Ibero-American Model Forest Network (RIABM), demonstrates Cuba’s willingness to join the regional organizations involved in the sustainable management of natural resources. It has allowed the territory to become an area of ​​national importance to demonstrate innovative practices of forest management and from which others can learn. The main challenges faced by the BMSM are: the lack of knowledge and participation in conservation efforts of the inhabitants of the area, the sustainable management of natural resources, the creation of inclusive employment sources, and with equal participation of women and men, as well as the search for financial resources, which allow overcoming technological limitations for the development of a forestry and artisanal industry that makes use of resources in a sustainable manner. The Sabanas de Manacas Model Forest is in the central region of Cuba, in the province of Villa Clara, Northwest of the city of Santa Clara, with an area of ​​1,717 km2. The area´s topography shows an extensive plain, with an approximate population of 77,500 inhabitants. 75% of the soils suffer from a certain degree of degradation, mainly due to the inadequate management of this resource and the loss of forest cover. 32% of the surface is dedicated to forestry. Forest areas represent 13.4% of the territory. 51% are natural forests and the remaining 49% is mainly pine plantations for productive purposes (Pinus caribaea var. Caribaea). The Model Forest territory includes several river basins, like Sagua La Grande and the Alacranes reservoir, the largest of its kind in the province and the second in the country. Within the BMSM is the Managed Floristic Reserve, Monte Ramonal with 3,388.4 ha, considered by some specialists as an ecological island. Its flora consists of 371 species, 239 genera and 79 families, of which 68 are endemic (Oviedo et al., 1987). Within the existing fauna, we find 83 bird species, of which 9 of them are national endemics, one in a great state of threat, 17 species of reptiles, 10 of mollusks and 6 of amphibians. The main economic base of the territory are sugarcane plantation, agricultural production, livestock and forestry, regardless of the existing industrial development and the production of the hand-woven fiber of the guano palm (Coccothrinax crinita), an activity deeply engrained in the culture of the inhabitants of the region, and an important source of economic sustenance. The Executive Board of BMSM is currently composed of 26 directors representing national organizations, such as economic-productive and social entities, research and teachers’ organizations, government entities, non-governmental organizations, private producers, among others. It constitutes a forum for consultation in which the main guidelines for the development strategy of the BMSM are debated and approved, respecting the specific interests of the inhabitants, owners and administrators of the territory as it was set out in its statutes. Experimental Station of Pastures and Forages of Santo Domingo. The Board of Directors has a President elected democratically by simple majority, for a period of two years with the possibility of being re-elected. It constitutes the highest instance of decision with established and approved regulations. These regulations clearly establish functions and powers of the Board of Directors, the presidency and the management team. The Administration Committee is composed of a director who serves as a link between the Board of Directors and the technical team responsible for carrying out the policies that the Board of Directors agrees to implement. Also, administratively and functionally, it represents the President and performs other functions that are established in its regulations. The Strategic Plan of the BMSM established six objectives or strategic lines to allow progress in reaching the goals. Each of the strategic lines includes actions suiting the general objective. Consolidation of the Sabanas de Manacas Model Forest proposal, improving the management and quality of its institutional work. Accomplishing an effective, transparent and sustainable operation as a key objective of the association of the BMSM. Contribution to the integral development of the territory by developing a diversified, innovative and sustainable economy that allows to improve the living conditions of its inhabitants in an equitable manner. Contribution to the sustainable management of natural resources, increasing their social, environmental and economic value. Encouraging the application of traditional practices and the promotion of applied scientific research to share experiences, technologies and information about the best practices. Promoting and spreading the BMSM development process at the national and / or regional level through the collaboration and the exchange of knowledge and experiences. Ensuring that all projects and strategies for equitable social development in the Model Forest territory consider gender equality as a determining component of social equity. Restoration of the landscape in towns and communities of the Model Forest.